The Scottish War Graves Project :: View topic - Cyril Ernest Ball KIA 22/11/1940? Posted: Wed Jul 24, 2013 7:55 pm Post subject: Cyril Ernest Ball KIA 22/11/1940? According to the following headstone Cyril Ball was killed in action on the 22nd November 1940. His marriage certificate gives his middle name as Ernest. 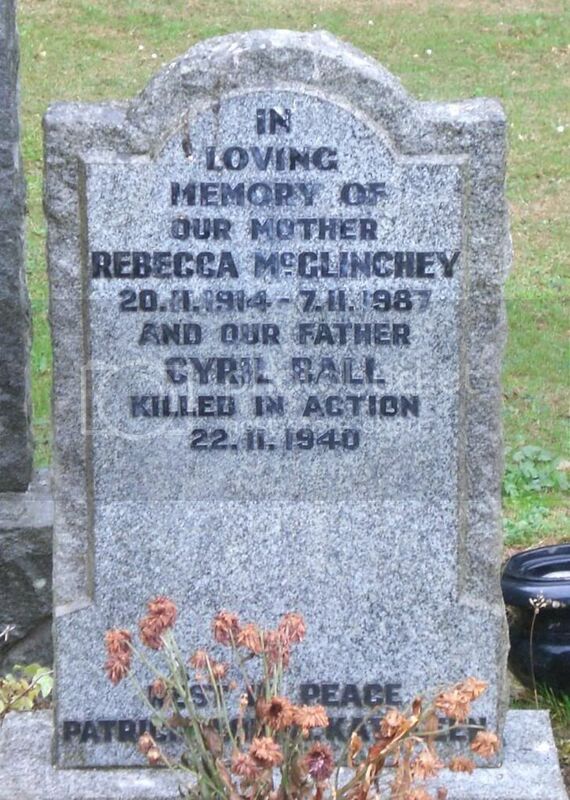 He married Rebecca McGlinchey in 1935 age 21 and was a seaman living in Crombie, Fife at the time. I haven't been able to locate him on the CWGC website nor find a death certificate on Scotlands People. Can anyone offer some guidance please? Posted: Wed Jul 24, 2013 9:42 pm Post subject: Cyril Ernest Ball KIA 22/11/1940? If he was still a seaman and a member of the Mercantile Marine, like any other civilian he could only qualify for the CWGC WW2 Civilian Rolll or a war grave in certain circumstances. A mistake is unlikely, but not impossible. I would be wary of the " kiiled in action " detail until you gain evidence to support this. Family myth might be at work here 47 years after his death. Just curious but was his father Ernest and his mother Caroline Appleford? Indeed they were Ken. Cyril was born in Cornwall in 1913. By the time of his marriage to Rebecca (1935) his father Ernest was an ordnance worker and they were living in Crombie.